In June 2010, I got my first grown-up job as a Content Writer at Fareportal, Inc. Fareportal is a discount travel company that – at the time – included CheapOair, OneTravel, and TripMama. 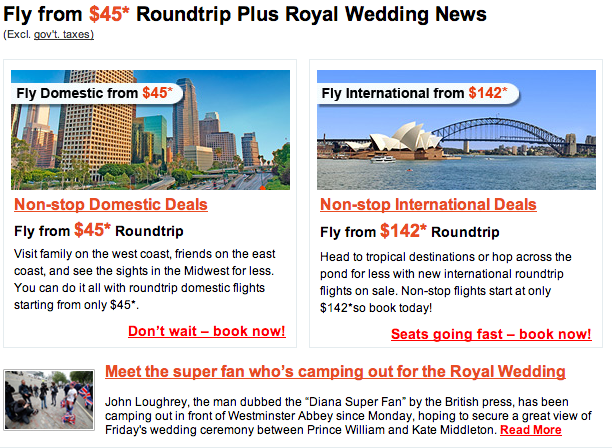 I wrote subject lines, content, and web banners to promote airfare, hotel, and car deals. Working with our design team, both in our New York offices and our office in India, was great experience in managing and internal communications. We eventually expanded, and I was lucky enough to contribute content for our mobile apps. I was eventually promoted and given the title of Marketing Promotions Specialist, which involved hiring and managing an intern. This entry was posted in Fareportal Inc. and tagged cheap flights, cheapoair, hotels, marketing, newsletter, newsletters, onetravel, travel, travel deals, tripmama. Bookmark the permalink.